I think I speak for both Sara and myself when I say that we have been completely overwhelmed by the response to our theme this week! It’s so much fun for us to hear from all of you, especially those of you who have been lurkerlicious up until this point! However…I have to say that I feel a bit of trepidation because so many of you have talked about how excited you are to see some kid-friendly meals and, to be totally honest, we only really have one real-food post planned this week. Oh, well–I guess that’s why we’ll have to do this again really soon! 1. In a large bowl, combine sugar, milk, whipping cream, and vanilla. Have one of your larger little helpers hold open one quart-sized bag and pour half of the mixture into the bag and zip shut, squeezing out all the air. Use duct tape to tape the opening shut (we actually, in a pinch, used electrical tape and it was fine!). Repeat with second bag. 2. 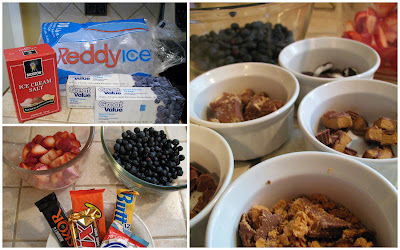 Place one filled bag inside one gallon-sized bag and sprinkle 1 c. of ice cream salt around each smaller bag. Add as much ice as you can comfortably fit into the gallon-sized bag, squeeze to remove excess air, and zip shut. Maneuver the ice around to make sure there’s ice on all sides of the smaller bag inside. Place in freezer while you repeat the process with the second bag. 3. When the second bag has been prepared, head outside. Be sure to bring the leftover ice and rock salt because you’re probably going to need to drain some of the salty water and replenish the ice supply while you’re tossing the ice cream. 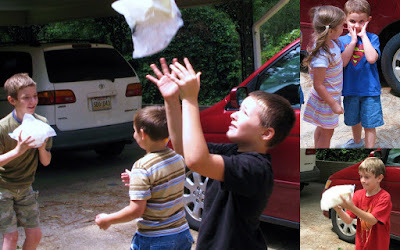 Let each kid take a turn (or a couple) tossing the bags of ice cream into the air or to each other. It gets C-O-L-D, so a pair of gloves won’t hurt anybody! That looks SO good. And it's fun for the kids. I'm wishing I had some whipping cream in my fridge right now. Who cares if it's 10:30 PM? I'd make it anyway! I love making ice cream in a bag! I do it with my students at the end of every year–always a big hit! Oh Yummy! I'm excited to try this one out. This is such a fun idea! And I bet it's YUMMY! Love it! Sometimes we use an old food storage can for the ice and salt and roll it. Fun no matter how you try it! Now this looks like something kids would enjoy making! What a fun and YUMMY idea!! My kids are all older and would absolutely love doing this! We did this in preschool. I love it! Ohhh, I can't wait to play catch! This is going to be fun. exciting!! i don't have an ice cream maker so this is awesome! We had a serious ice-cream-making disaster last week, and I really wish I had had this then. Henry was heartbroken over the lack of homemade ice cream… YUM! And so fun. Yum!! Sounds like a lot of fun!! MMMMMM! We just made ice-cream on Saturday. Should have thought of this to keep the kids entertained while waiting for it, instead of using the old ice-cream freezer! This looks like so much fun. We've done it in rolling coffee cans but not the bag toss. I love it! Have done it with large and regular coffee cans where you roll the can. Love that soft ice cream!! This looks so fun! I especially love the mix-in options and having a way to get the kids involved. I'm pretty new to your blog, but I'm so excited about this week's theme! Both the pudding pops and the ice cream look so easy and so fun! My kids are going to love it! Oh my kids are going to have a BLAST with this! Can't wait to try it. We used to do this every summer when we were younger! So much fun for the little ones. mmmm, pick me! pick me! Oh I totally forgot about this!!! I have seen this before, but it slipped my mind on how fun this would be to try out with the kiddos! Thanks for the yummy reminder! They're gonna love you for it! Thanks for sharing! My kids would love this, but I can definately see how it would be fun for big groups. Thanks! I always forget about this too, but when I remember it reminds me of school. It is such a fun activity for teachers to do. FUN!! I think even a bunch of teenagers would love doing this!! yumm, homemade ice cream IS the best! too bad i don't have any kids to make it with. oh well, who needs kids, right?? This post is perfect since my kids love to play with their food!! I'm definitely saving this idea for when my littles are big enough to do it! Oh, this would be so fun to do with all my nieces and nephews (and my kids too…) Thanks, Little Miss Kate. Oh I've done this before with kids! So awesome, the kids are always super impressed! This is one of my favorite summertime activities. Thanks for sharing. I was just trying to figure out how the heck I would entertain my kids today. This sounds like a great solution. My weakness: ice cream. I will have to try this one. This was my end of the year treat for my science class, one final experiment. So much fun! This sounds like delicious fun!! my kids love this! I didn't have whipping cream in my recipe, though. I bet that makes a huge difference. Thanks! I had no idea you could make ice cream this way!! How fun!! I can't wait to try it! This Vegas heat is KILLING me and I think this will help!! This brings back memories of summer camp. Thanks for reminding me. I love doing this. I always did it with my students on the last day of school! Mmmm….so going to try this. Oh my gosh, Will is going to love this! I'm so glad you posted this! I've done this with my kids once before and then promptly lost the recipe and haven't done it since. No excuses now! Yum. That looks like so much fun. I think we will have to try this! mmmm. delish! and since i dont have a regular ice cream maker, what a great way to do it! Love it. You can also wrap the plastic bags in newspaper and masking tape, making it into a ball, which helps keep the coldness inside and not freezing your fingers! oh how fun. my kids would love it! We used to do this when I was a kid, except we would put the ice cream baggies in a #10 tin can (coffee can sized) loaded with rock salt and ice, and then roll them back and forth to each other. My dad would fish out the winter gloves for us so our hands wouldn't get so cold. Fun! So…how 'bout them giveaways? Excited to see so many of us coming out onto the forum for these great recipes. These are fun for kids of all ages! I've never seen or heard of this before – what a fun activity to do out in the sun and then be able to cool off with a real nice treat. Can't wait to give this a try. Thanks! What a fun idea!! thanks! Great idea! We have one of those ice cream balls that the kids can push around while it churns ice cream, too! Fun times! My daughter did something like this with her kindergarten class and loved it. GREAT idea for those hot days! LOL awesome! And totally keeps the kids busy great idea! Did you say this was for kids? 'Cuz I think that my hubby and I might just try this tonight. Sans kiddos. Yum! I'm going to try this with my daughter this weekend!! Sounds like a delicious lesson in patience! This one my boy will love, specifically since he can toss it around! Thanks again for a great recipe! We've got a family reunion this weekend, this will definitely be a hit! This is a fun way to involve kids in fixing their food! Thanks. I am lovin' kids week. These look so fun and should entertain the kids for a while. Thanks! What a fun & cute idea! It looks really yummy too! i think i am going to do this for scouts tonight. sounds fun! thank you so much! I remember doing this as a kid 🙂 Just the astonishment of "Wow.. that really worked!" was fun enough for us! This is a family tradition in my husbands family. The duct tape is such a good idea; we'll have to try it next time. Salty ice cream is not good! good idea and great fun!!!!! Just wanted to say thanks for the pie pointers last week. I totally won first place (for best flavor) in the pie contest! Your banana cream pie is so awesome! I remember doing this as a kid in science class, so yummy! Ah-ha! The easy-peasy and inexpensive version of the ice cream ball thing! I love it. Not sure my 2-year-old would grasp what we were doing, but definitely a fun activity to keep in mind! Seriously, why have I never thought of this?!? I know what we're having for dessert next Monday night for FHE. Made the chocolate mint pudding pops last night, can't wait to eat them tonight. Think we'll try the ice cream with our 9-year old and one of his friends later this week. yum, i've done this before too, but i forgot all about it! My three boys would LOVE this…fun, fun, and yum, yum!! Yummy! What a fun family activity. I made ice cream in a bag for the 1st time last year, and it was pretty good. Thanks for the recipe and idea! My parents used to do this with us when my brother and I were little. It's so much fun! What a fun way to work off the calories before you dive into a big bowl of icecream. Yummy! So cool, my kids will love this one! Fun! I've seen this recipe before but your post really makes me want to try it! This is one of my favorite ways to make ice cream! Kids love it! Reminds me of summer science camp. YUM! This looks like a lot of fun! My family used to do something similar, but we would roll cans back and forth with the ingredients inside. Keep bringing on the great kid friendly ideas! I especially love cool treats! SO FUN! I want to win!! This recipe looks better than the one I've used. We wrapped ours in newspaper and taped it to make a ball to toss around (helps it not to get your hands as cold and messy too). Sounds like a fun summertime activity! Yummy! I don't think my 2 year olds would be patient enough for this though, maybe next year. We haven't made this in a while, and the weather is FINALLY getting hot, so maybe a stop at the grocery store is in need so we can have some yummy homemade ice cream! Thanks for the idea! Fun! I have a ball I make ice cream in and you can kick it around, but it doesn't make very much. This seems like a great idea! Thanks! I remember using one of those old churning things to make ice cream as a kid but this looks like way more fun! And I agree- ice cream is a food group in and of itself. Yummy! I've never tried this and have always wanted to! Thanks for the fun activity to do with my kids. I love the way you incorporated the kids to help making this dessert. I love me some ice cream! What a great, easy way to make ice cream! Will bookmark this for when my little girl is old enough to help, cuz I think I'd look pretty silly doing this by myself! 🙂 Thanks so much! I've had this before, but had no idea how to do it myself. Thank you! what a great idea! keeps the kids busy for a whole 10-15 min!!! I've heard of doing this before, the pictures made it look so yummy. I think we'll give this a try. We have done this before and it was a HUGE hit with the kids. Thanks for sharing! My favorite part is the duct tape sealed bags . . . I don't know it still could cause an accident, then they could lick it off each other. Ok – So I had a babysitter for my kids a few years ago that did this with them. She brought the ingredients (except the milk and ice) and they had a ball doing this in the backyard. What FUN!!! Yummy, I have always wanted to try this with my kids. What a great idea! I can't wait to try it out! How fun and yummy (=fummy?). Looks like a great activity to do with my boys age 5 and 3!! Thanks for sharing! Delicious and entertaining! Love it! The kids will love it too! Maybe we could do this at a primary activity! We will have to do this over the weekend! I haven't done this since my preschool cohort at BYU! I forgot how fun this is to do with the kids! Great ideas guys! Oh we will have to try this! Our extended family did this at a family reunion one year. Except we did them in cans. It was really fun to watch people rolling their can all over, waiting for their yummy ice cream. I've been seeing these pop up a lot lately! I'm going to have to try them! I think this will be a great FHE activity/treat next week. Thanks! great idea! this would be perfect for a birthday party or something…and hopefully it will tucker the kiddos right out! I love this idea. I think we are going to make this tomorrow afternoon. I totally remember doing this as a kid! I forgot about making this when I was little! Thanks for the recipe. What a fun way to make dessert. This one will have to wait until the 24th of July as an activity for all the kids to try. We did this once as a young womens activity and they loved it. Need to try it with my kids now! I just may do that for our Friday Ice cream tonight! Sounds so yummy!! When I read this post out loud late Wednesday night my husband was kind of skeptical about the idea. I think I'm going to make it and prove him wrong!! So fun! We've done this before, but I never thought to put in all of the add-in ideas. Great idea! We will have to try this this weekend. Fun! My son would love doing this. I've seen this done before but I'm a pansy and afraid to let kids toss food around like that. But the taping it up looks better than just hoping my zipper bag will hold. Thanks! Yummm!!! Lucky kiddos. I don't remember having this much fun with my food growing up! Is it too late yet?? I just bought my popsicle holders at Target today! It's about 99 degrees outside…in the NW. A/C is not very common around here. Including our house! I loooved homemade icecream growing up…but didn't know you could make it in ziploc bags! We just made these with two 4-year-old boys. Delicious end product. 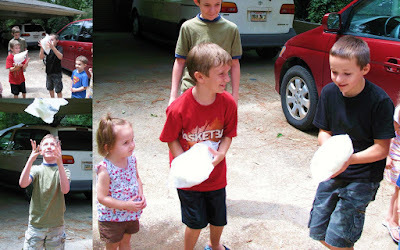 I was so thrilled to pull off a real "mom" project on a hot day. Seriously, wear gloves! My fingers almost got frostbite 🙂 It was a little soupy after the kids tossing it about, but the remainder went in the freezer and two hours later was absolutely PERFECT frozen yogurt consistency. I love this site. Thank you Kate & Sara! Thanks for this! I have two boys, only one of whom will eat ice cream but he can't wait to try this. ANy ideas of how to make the ice cream chocolate? Or, should we just use chocolate milk instead of white? This recipe was really good. I did it with my preschool group and expected it to be fun, but not really good. It tasted good, was easy, and forgiving. ❮ Previous Post Previous post: Kids Week: Frozen Pudding Pops!